Shoulder pain is one of the most common conditions we see at the clinic. Common symptoms of shoulder pain include aching on the side of the upper arm or aching on the side and front of the shoulder. If you are experiencing any type of shoulder pain, you may notice that the affected shoulder may be painful to lift. A ‘catching’ sensation may also occur with any reaching movements. Particularly frustrating is the sleep disturbance that comes from not being able to lie on the painful side. The shoulder joint is really a combination of several parts. Including the shoulder joint proper between the upper arm and thoracic cage, as well as joints formed by the collar bone and shoulder blade. The shoulder needs to be incredibly mobile and in doing so sacrifices stability. In some cases the pain comes on gradually from repetitive strain. Activities that commonly see overuse of the shoulder joint are tennis, weight lifting, swimming, and even regular habits involving posture and daily activity. Other forms of shoulder problems can also be caused by a single traumatic event experienced by our clients. 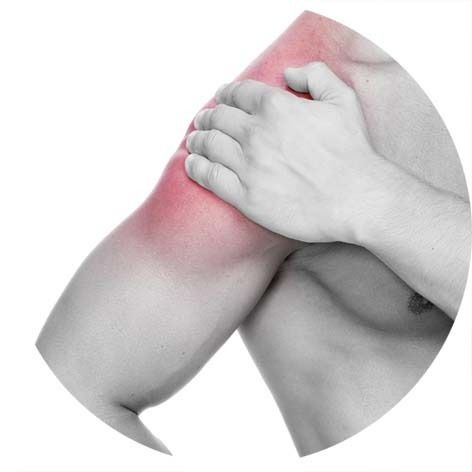 Osteopaths at Radius Osteopathic assess the shoulder joint as well as the supporting muscles, ligaments and tendons in order to determine the source of pain. The culprits often involve the tendons and tissues that support the shoulder. Issues with these structures can lead to conditions such as tendonosis, tendonitis, bursitis, frozen shoulder, and rotator cuff tears. Any contributing factors such as rounded shoulders, muscle imbalances of the shoulder blades or stiffness of the midback are also assessed. Shoulder pain is often the end result of biomechanical dysfunctions layered one on top of another. However, Osteopaths are well trained to identify these biomechanical deficiencies, and can help you find solutions for your shoulder issues. For example, the upper arm bone is often not properly centred in the joint due to an imbalance between the powerful deltoid muscle and the often weaker rotator cuff muscles. This leads to the arm being jammed into the shoulder socket any time one lifts the arm. Eventually this leads to issues such as bursitis or tendonosis, as structures become impinged. Once these types of dysfunctions are recognised, both the cause and effect of the pain can be treated. Call us on 9379 4151, or book online if you would like to know just how we can help you move and feel better today.